This Biography of the co-founders of the Canadian Army Veterans Motorcycle Organization (CAV) and subsequent Units will explain the birth of this great organization. It began with two military veteran motorcyclists meeting at a Charity Ride in 2003. These two individuals, were combining their love of motorcycle riding and at the same time were drawn to continue supporting their community after their military service. The instant bond on meeting at this ride, was a confirmation of the brotherhood forged by all soldiers, sailors or airmen during their military experience. These two riders were P.M. ’Trapper’ Cane and J.S.Y. ‘Doc’ Lebrun. P.M. ‘Trapper’ Cane CD, born in Cobourg Ontario enlisted in 1970’s in the ‘Canadian Armed Forces’, soldiered with Princess Patricias Canadian Light Infantry and the Canadian Airborne Regiment on numerous United Nations, North Atlantic Treaty Organization Operations, world wide…A lifetime motorcyclist he knew too well the fate that meet’s many military survivors, one moment in time he was serving in the Pathfinder Platoon, as a Sniper, Mountain Warfare Instructor and recently top candidate of the CF’s Advanced RECCE Patrolman’s Course. The next moment he was Paralyzed after a 180 ft free descent after a parachute collapse on operations. Retired medically in the 1990’s after 18 surgeries and 2 years in hospital, motorcycling was the only physical remainder of his old life. As Trapper says ‘’Doc was the spark, I was the punky old dried out tinder that lit the big fire that became the C.A.V.’’ [did we mention that Trapper was a Survival Instructor in Winter/Jungle Warfare?] At any Rate, Trapper’s years of road riding and observing the good, bad and ugly of organized riding, led to the first constitution and the symbol that is The C.A.V, a WW2 dispatch rider [from a recruiting poster] and the name/acronym, ‘The C.A.V. 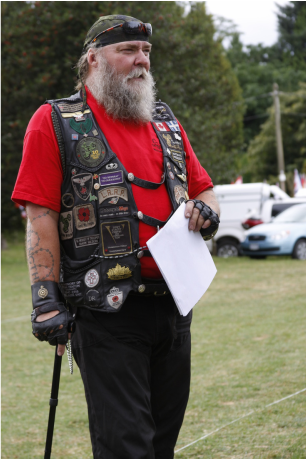 Canadian Army Veterans’. This came to Trapper as he and Doc rode side by side on a beautiful summer day. Trapper yelled over to Doc “Remember this day, remember this spot, this is were it started”, Doc was asked to get a Vest for a Crest and as the manufacture of a Custom Crest had a minimal order of six, Trapper and Doc proudly sewed on their Identification as The C.A.V. and at that point there were four extra crests…They laughingly said-‘In 10 years if its just the two of us, then so be it”. Immediately; however, veterans and still-serving riders alike began to come aboard-from Central Canada and to the East and West Coast’s –veterans and serving riders “Got It” and proudly saw their own identity! In 10 years the C.A.V. has grown to a national level riding group, gaining ‘Strength and Honour’ as each kilometer rolls by. The 46 units and thousands of riders, both Veterans and Supporters, riding with the CAV/VAC, have helped direct over 5 million dollars nationwide for community need's. The future look’s bright and all roads are clear as the mission continues ! !